On May 12, 2016, students in Professor Gould’s senior seminar hosted a community dialog about water as part of their collaboration with Burlington City Arts. 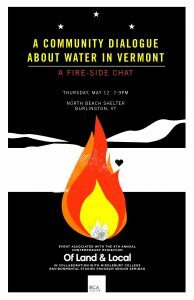 This event featured a discussion about the significance of water in Vermont through the form of personal narratives. Artists from Of Land & Local attended to talk about their work in the exhibit, sparking a larger conversation on how artwork can play a role in the Vermont community’s appreciation for sustainability, specifically pertaining to water.